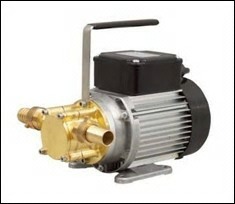 Self priming flexible impeller progressive cavity pump for hot water, diesel and heating oil. Single phase, surface mounted/portable. No automatic pressure control. 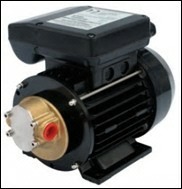 Heavy oil and viscous liquid gear pump. This gear oil pump has bronze gears (progressive cavity) and a brass body for pumping of non-corrosive viscous (heavy oils etc) fluids with few impurities. Pumped liquid : Water, Oil, Heavy Oil, etc.